I felt like as if I have dropped out of this Earth. Does transitioning of years (man-defined even but with backings of astrology sorts of course) has anything to do with it? Does everyone fall out and return just like me? Or am I the only one? * insert mysterious tune at the background * Since we are at that , why not ask who am I? Where does the world comes from? Pardon me as I have been a tad philosophical recently due to reading a really good book that weaves the history of philosophy together in a 400 page story – Sophie’s World. The amazing thing is, a good friend introduced me to read it, so I went in search in the MPH bookstore and found one lonely book left and quickly grab it and ran to the counter with it under my sleeves lest somebody came to fight with me for it! I got out alive and thus been enjoying reading tremendously. Just about weeks later, I casually saunter into the same MPH bookstore, and walk around, lo and behold at the middle of the store on the tables where they usually showcase pick of the week or bestselling books, there are mountains, yes mountains!, of Sophie’s World stacked up on the table mocking me. At that time I was wondering if there is a conspiracy following what I read (such arrogance) but now on retrospect (writing does this to me), it seems then that they normally feature books that they just restocked (I bought the last one remember) so maybe to just get the books moving! Bah, I hope this assumption is wrong as we would not want our ‘pick of the week’ to be actually truly ‘new stock of the pick’, it takes the novelty out of it, it would even be slightly, just slightly better if it is ‘rokh’s current reading’ right? 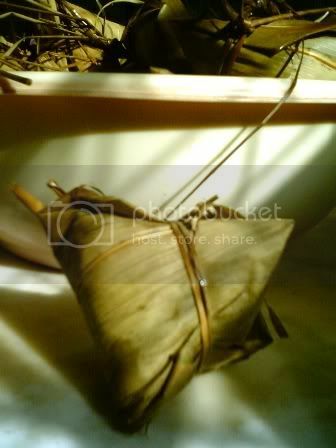 Oh this was definitely one of my own favourite posts too, as I learnt the ‘dying’ art of making Chinese bak chang. I was really worried then soon one day this will be lost to our current and future generations, as many now choose to purchase the commercial ones or eat at restaurants rather than make their own. Making them with Lai Ma that time was truly exciting and in short, though this may make me sound real young and over enthusiastic, simply awesome! I love how we had walked down the street from her house to an old wooden tim chai(sundry shop) nearby to get the bamboo leaves and the peas to the whole process of preparing all the ingredients which seemed like an endless list of things, but when you get down to it, it isn’t all that immense after all, then to the cooking of the meat and then frying of the rice to scooping all of the fillings onto the leaves and to what seem like my honest attempt to wrap them all in and then lowering them into boiling water while uttering some sort of prayer that it will not all turned loose and became a huge mess. After the whole endeavour, the bak chang came out perfect and somehow it tasted extremely good, thanks to all the heart and sweat poured into it. So go on and read about it all here, and who knows, you may make a resolution to make one for yourself this year? Oh how can I forget this food adventure of J and mine, at the food haven up north of Malaysia. Thinking back on all the food we had consumed in a span of one day, and yes ONE day, makes me shudder. I felt I had ate for the entire week! 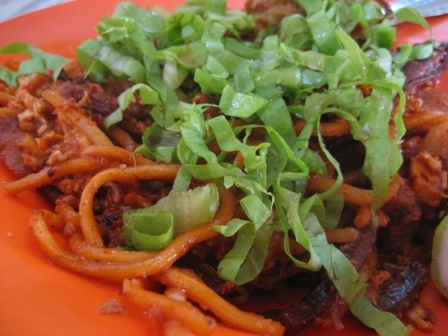 One of the most memorable dishes that I had in Penang that time, apart from my all time favourite Kek Lok Si laksa of course, is the Mee Mamak. The sinful plate of red stir fried noodles has a huge myriad of flavours all packed into this seemingly simple dish. Now I have a sudden hankering for it. Ah, it will definitely be on top of my list if I ever go visit Penang again. Ah, so it seems that a lot of people googled for this recipe and I hope it did certainly helped many of them to have this dish grace their dinner table and feed many tham jiaks out there. Though I would have loved to re-enact this dish instead with a huge fresh fish, but nonetheless what I managed to concoct the other day remained fresh in my mind. The recipe was definitely a keeper and one day I shall attempt it again when I get my hand on some good fish. 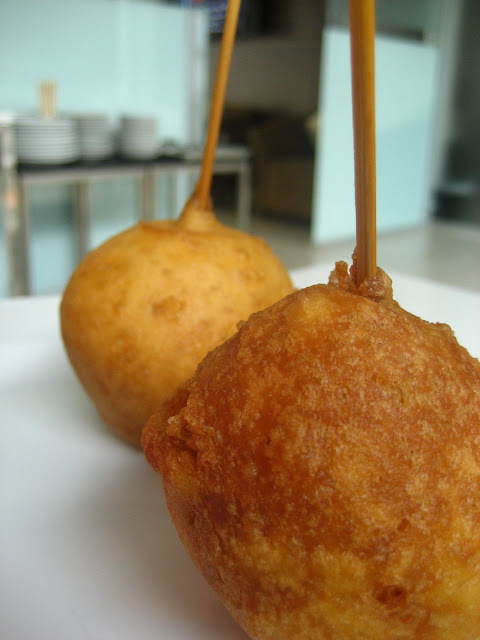 This was definitely one of my favourite attempted recipe, one that is truly Chinese yet able to satisfy my sweet tooth. 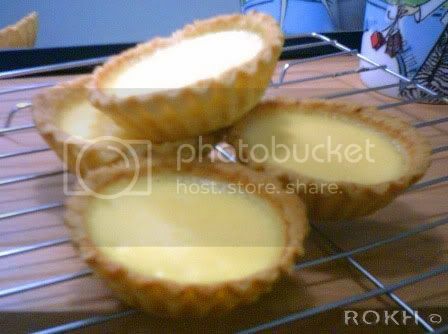 Since young I have loved this dainty dessert and especially so after the Portuguese egg tarts made their inception in Taiping. Although this recipe of mine was not of my favourite Portuguese egg tart (the idea of puffy crust still scares me, but one day I shall brace it like how I did for my Sponge Cake), but I still love the soft eggy and slightly sweet filling and the cookie-style crust was quite good too. Yes I do have to admit that, although I have been to Bangkok for numerous times, yes even at one point I am there more than I am in Malaysia, this had been the one of the very few post on Bangkok food, and it turned out that the crowd pleaser was the street snacks. I guess sometimes when one go to someplace too much, they took for granted all the good food that they can have all the time there and forgot to document everything down as if it is really precious. Looking back now, I really do miss a lot of Bangkok food, and someday I am so heading back there again (though I also had numerous time swore I did not want to go back after many, many flights), not just for the shopping, which was unbelievably cheap, but definitely for all the a-roi (delicious) food there. Oh I have a sudden vivid recollection of my favourite, one must be forewarned when reminiscing on food that it will leave a huge longing in the heart. Now I know that so many people out there shared my sentiment to this meat call pork, and one that have been barbecued to point of charred skin but locked with all the sweet meaty juiciness inside. Ah, just trying to describe this special dish again makes my mouth waters. Anyhow, I have indeed wrote a long post of praise to it, so head on to read all about and where to get your hands, or rather teeth in this case on it, and the best ones at that. What are you waiting for? Although this post was also about Hak Lor Mai, the sweet Chinese dessert that uses Pandan Leaves, it seemed that the whole information in regards to pandan leaves was the main attraction to people. Probably I took this leave for granted, having it embedded in our various local cuisines from aromatic Nasi Lemak to kaya (coconut jam) to kuih-muih. It is no wonder that these plain looking leaves in disguise of a wonderful yet not intruding aroma that it imparts to anything it came in contact with, in this case cooking with would garner so much attention to this date. I am so grateful that it is one thing that is easily obtained in Malaysia. It seemed that this guest post of mine from my dear friend L is here to stay definitely, with her extensive research and also eating of course on the many types of Chee Cheong Fun that one can find in Malaysia. We might not have covered the whole Malaysia entirely but even then, we have already manage to find four variations of totally diverse style and sauces, but all with the main ingredient of steamed rice flour sheets rolled up. I for one feel the need to inject here that, although I have tried so many of the types mentioned, the Taiping style Chee Cheong Fun is the best and shall always hold a special place in my heart, bias I may be, but it is really tasty, one must try it at least once in their lifetime! So there you have it, the top 8 posts of this blog. From here I would announce my return to planet Earth, and I would like to resume some sort of normality, then again what is normal? Nevertheless, stick around a little longer as I have a long postponed write up on chickens, and I promised it is going to be interesting, think free range and castration (yes, you read this right). Till then, happy eating and cheers to a 2010 that would be filled with loads of good food!